It’s a good thing that we will not have any clean articles of clothing (or bedding) if I do not do the laundry. When one has to, one will naturally learn. After some time of being on our own, I think I have a laundry system I’m happy with, and I’m ready to share. When we first got our keys, I really disliked the giant pipe that took up critical space beside what was intended for the washing machine. It meant that I cannot have a washer and dryer side by side where it is most space saving, but we’ve worked it out and put that area to good use. 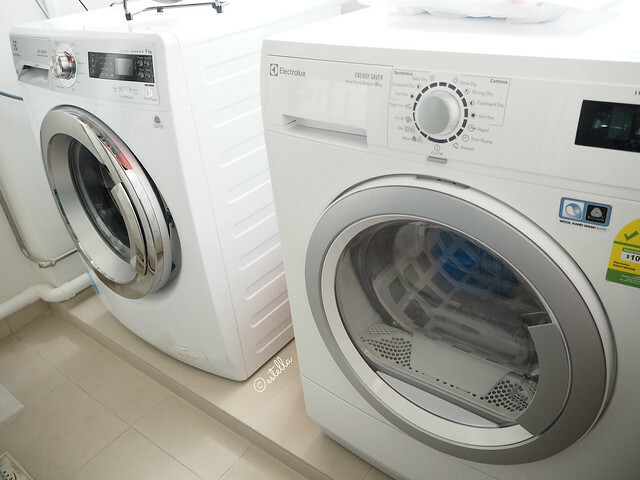 Lets talk about my washer and dryer first. They sit side by side lengthwise in our service yard. The disadvantage of this set up is some difficulty in accessing the drying racks outside the service yard. To solve this, I’ve left a gap of about 60cm between the machines but, we’ve realised that we didn’t really need to use that drying rack afterall, too dusty outside. 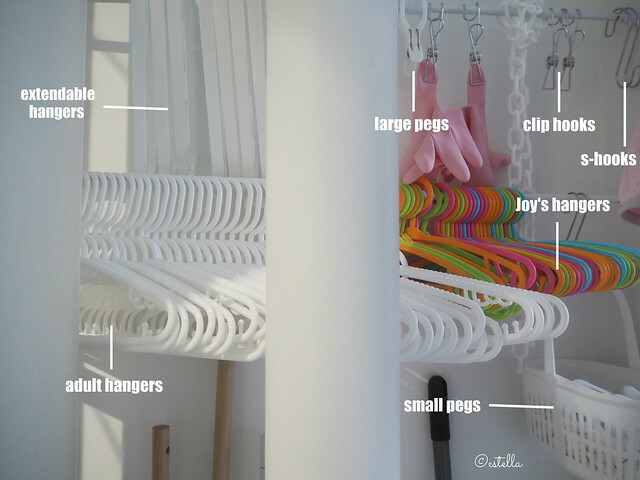 And now my favourite part – how we store the hangers, pegs and all. Almost everything hangs on extension poles from Daiso. I just measured the width of that area, went to a store and picked one that would fit. We have 2 layers of the extension poles for now, because that’s how high I can go without needing to tiptoe but I will add another layer soon, for stuff that we don’t use often to free up space for the lower layers. 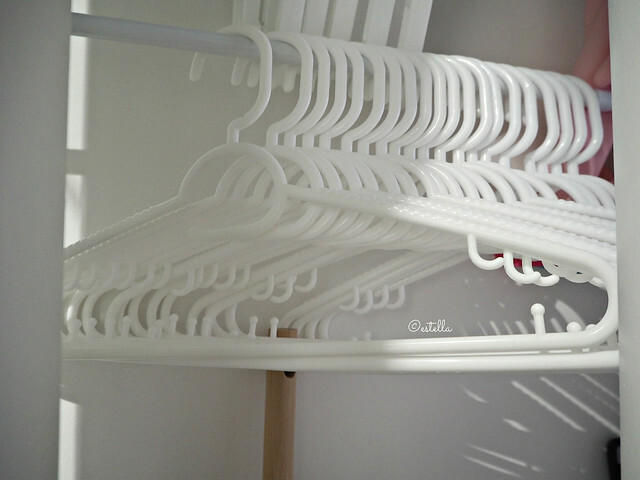 To make it look less cluttered, I picked everything in white, except for Joy’s hangers – it really works. Initially, I didn’t know how many small pegs to buy, so I bought just one packet from Daiso, together with a peg basket. Turns out, it’s just enough for a family of three, even though Joy and I go through a lot of clothing each day. 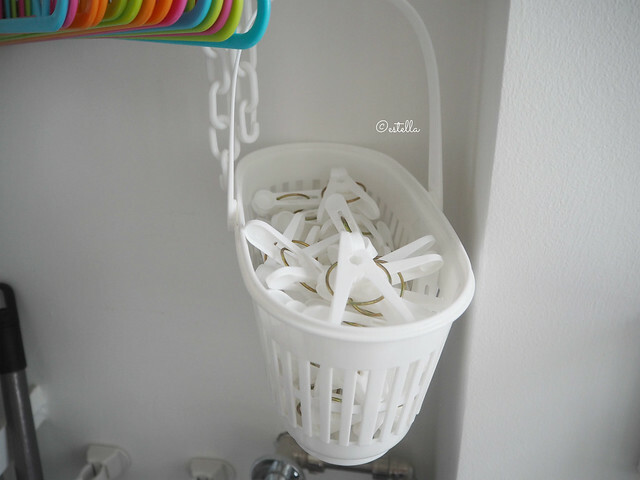 This peg basket is love, because its simplistic, white and enough. I have just a packet of larger white pegs from Daiso, and that’s enough too for me. Sometimes, I don’t even use them at all. I was stoked to chance upon these hangers at Daiso. For $2 a bunch, they have hooks at the right places for every one of my needs. I scoured different stores to get enough of the white version, and might have overbought a little. 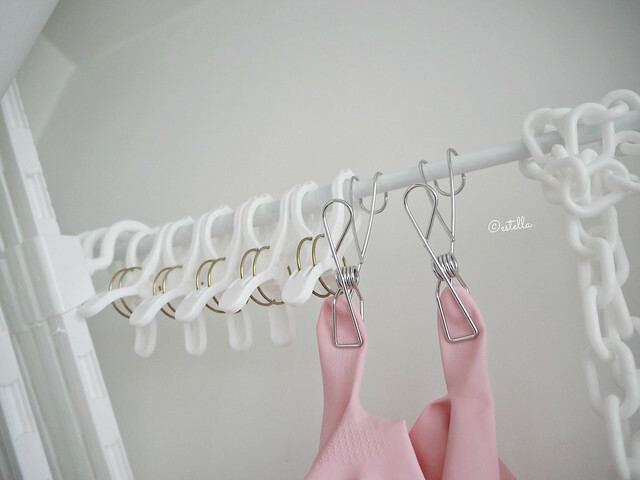 I think one very useful practice we adopted is to use the exact hangers we use in the wardrobe for the laundry. It helps us be more efficient when putting up clothing to dry / keeping them (topic for a later post). These rainbow ones are for Joy’s wardrobe. 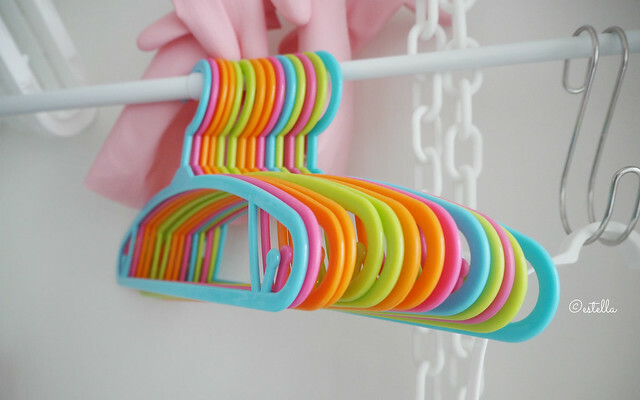 Our home has a white theme, so I picked colourful mini hangers for some fun when she opens her wardrobe. Frankly, they’re a little small and I might have to relook her hangers in a year or two, but for now, we’re happy. In case you don’t know, I am the biggest Muji fan, because of their product design. These are indulgences I suppose, but they are incredibly useful tools I couldn’t find elsewhere. 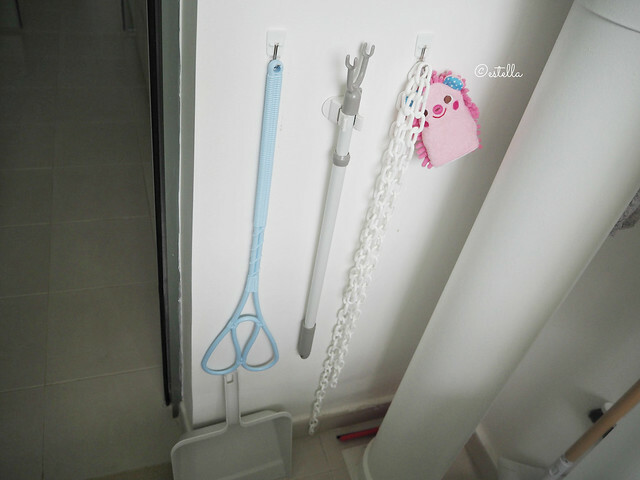 I use the hook clips for kitchen towels, mop cloths and also to kiap and hang up my dishwashing and gardening gloves – so useful. The S hooks are “double layer” and I trust it to hold more weight. 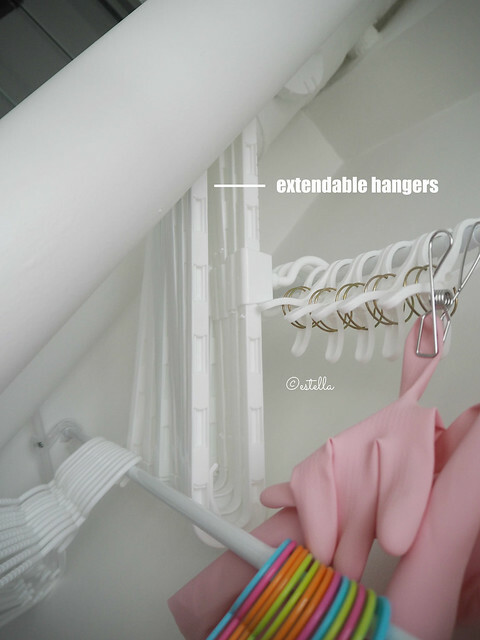 These extendable hangers (also from Daiso!) are the bomb. 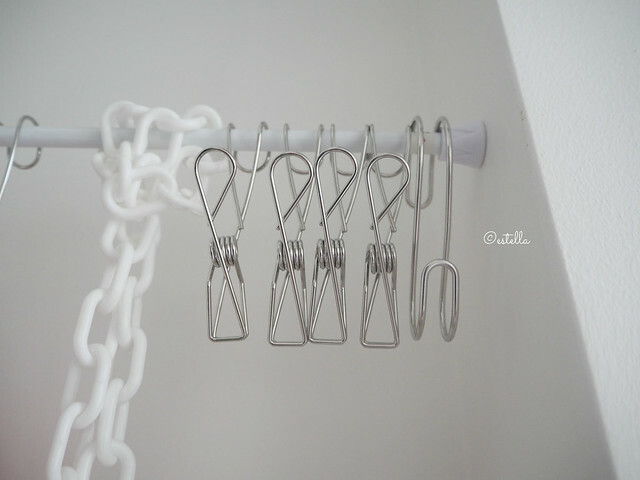 I use them whenever I want to hang up single bedsheets, towels or larger articles for drying. When extended, it can fit a single bedsheet width wise but when retracted, they are just slightly larger than a normal hanger, so it saves a lot of space! My pole equipment for laundry and a laundry chain are secured to the side of the wall with hooks from 3M and one of those pole holders also from Daiso. At the other end of the service yard, we built a white sink. Before we received our keys, I had grand plans for the laundry room (read about it here), including a dedicated laundry pail, but it turned out to be most practical for us to use a sink with a high chair. For one, the water can be drained away easily and for two the sink support can double up as a table. I also use this area for washing up things like make up brushes and paint brushes. 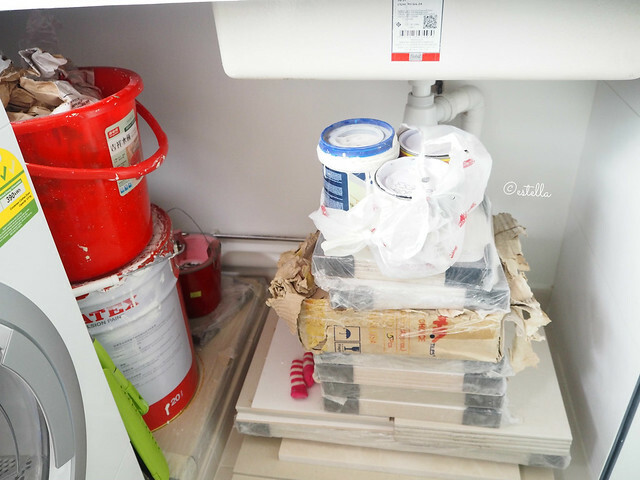 There is also storage space under the laundry sink, but I can’t utilise it right now, because there are still painting materials and a lot of tiles kept here. Can’t wait for everything to be done, so that we can start utilising all the space. One last thing I’m happy about is how we have sufficient power points in the service yard. 1 additional beside the original washing machine power point and 2 additional ones beside the sink. 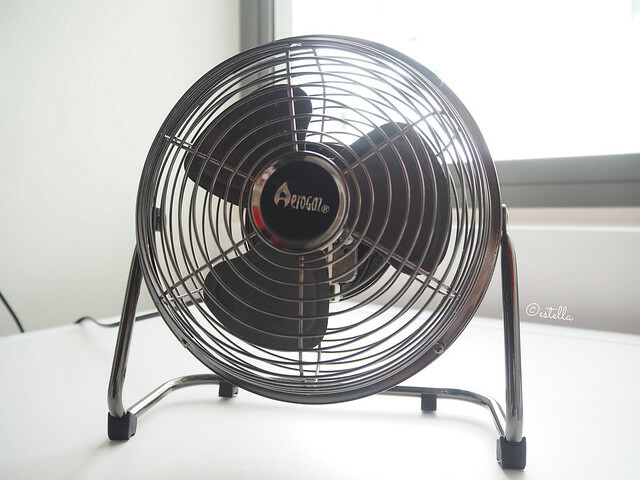 It allows us the comfort of having a mini fan in the service yard during warmer days (like now!) and then a spare for whatever other needs that pop up from time to time. This is the first post on our new home. To be honest, I struggled with picking a topic to start on because there are way too many things to write about. 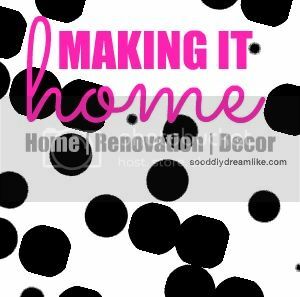 In the end, I picked the laundry room to write about because it is the most completed as of now and also because it happened to be the first topic I wrote about when I started a series on the blog about home renovation and decor. Next, I’ve already started writing about a laundry system that works for us and it’ll be published next week. Can’t wait! You can browse through other posts in this series by clicking on the picture below. Have fun! Oh my, great to hear from you Diana. Kitchen is my love but I’m still unpacking haha. Soon! Wow, I admire your effort of designing your laundry room. I have zero clue in home design. Haha. By the way, nice meeting you via blog hopping. It’s incredible to see how well thought-out your laundry room is! My laundry room is super basic, which is nice because it gets the job done and all, but I do wish my laundry room can be as systematic as this. Good job, really, for someone who has never done laundry for 34 years of her life! Haha, thank you so much! Perhaps it’s because I’m doing it for the first time in my life that makes it a reason for me to think through my laundry room more. Looks like a very organized laundry room. Mine is pretty tiny to hold all the laundry of a family of five! Love the stuff at Muji too! I am sure envious.. you have a nice home which you put a lot of effort in.. including just your laundry room…..
What a lovely laundry area. Congratulations on your new home! Can’t wait to read about the rest of your home. i love muji items too but they r so pricey sobs sobs.. Ya lor the space really can’t control, can only try to maximise it. Try white, really helps with the messiness! Reading your post give me an idea how I should hand my clothes nicely. Thanks for sharing. haha no problem at all. I also trial and error one. Oh wow! I love how your laundry room looks. Thanks for the tips as well! The laundry room looks amazing. I can’t wait to see the rest of your house too!!! 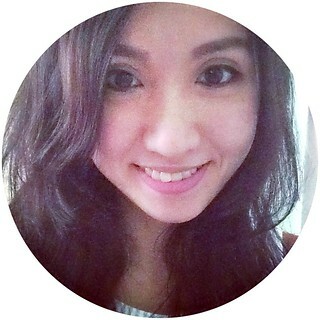 haha white lor, but really effective to keep the look less cluttered. Such an organised laundry room. You clearly have put lots of thinking into this space. Well done. With some luck as well, luckily Daiso happened to have what I needed! I am loving it Estella and now waiting to see your kitchen. Me too wished to have a proper laundry room like this one. Haha, I’m still unpacking for the Kitchen. I can’t wait for everything to be finally in place as well. 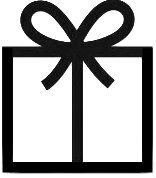 Hope you get your wish! Laundry room also can blog until so nice (with hangars and clips and what not). I am going to move house soon. Thanks for your comprehensive info. Going to organise my laundry in well manner. For cleaning.i still prefer traditional way by washing machine and dry under hot sun. What a neatly organised laundry room you have! 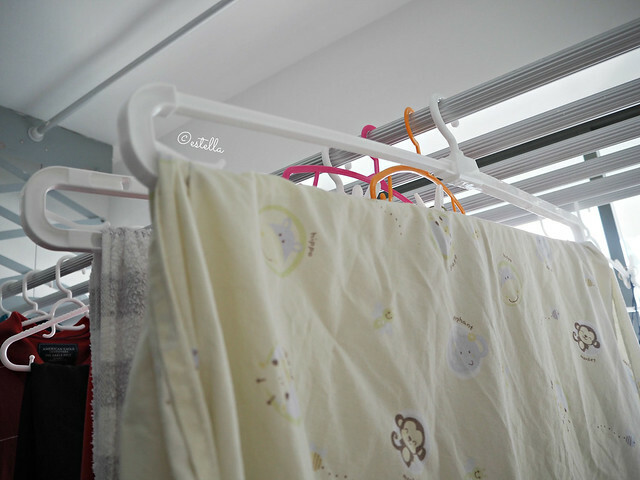 Now I shall go hunt for that extendable hanger from Daiso too! Oh yes, that one is very useful! Ooo… I like the extendable hangers! I like white colour design!! !I like your house!!! Hehe I love white in a home, it makes the place feel bright and airy. Laundry room? What laundry room! Mine shares a little space with the kitchen hahaha thanks for sharing the fact that Similar colours will make the kitchen look less cluttered. In this case, white. It was born out of necessity, I get frustrated when I do double work / waste time etc. You made me happy that you liked this! LOL i think my laundry room will evolve with time. It’s not difficult and you should be able to do it best for yourself, because only you know your habits and whats convenient for you. Hope you have a laundry room eventually, its therapeutic to be able to shut myself away and do my laundry in peace! 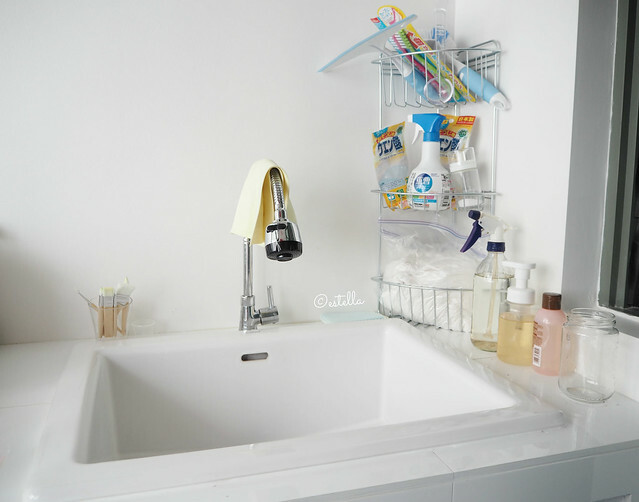 love how you put everything together in your laundry room! Now i just wish my laundry is as spacious as this! I was inspired by the Japanese and how they manage to fit things into very very small spaces. My space is pretty large for a BTO but it’s totally doable for even smaller spaces! How lovely, so organized! Big fan of whites here too. Wah! So nice and white! I yike!! Hi! Thanks for sharing! Its so inspiring and doable! Love the thoughtfulness. Can you please share where did you get your sink and how the outlet works; also the layout with the washing machine? Mine seems Too small for it and there’s only one outlet! I got my sink from Hoe Kee, there is only one in this size! I think it shares the same outlet as my washing machine, so my contractor had this caveat that I could only use the washing machine or the sink at any one time, not both, which is fine with me. I don’t have the height space to do washer / dryer stacked, so I did washer and dryer side by side and the sink facing them. :) Just enough space only.